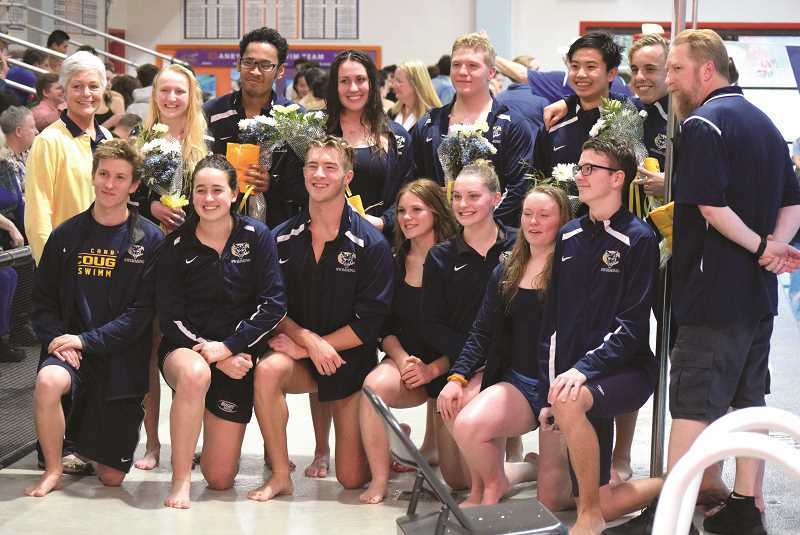 It was senior night for the Canby swim team on Thursday, Jan. 31. The Cougars hosted the West Linn Lions, and while they ultimately ended up coming up short against the boys' and girls' visiting squad, they made sure to acknowledge the efforts of the senior swimmers. West Linn also acknowledged the seniors on its squads. For Canby head coach Eric Laitinen, the senior class was crucial for the development of his incredibly young team. According to Laitinen, the swimmers are predominantly underclassmen with a heavy concentration of freshmen. Having leadership to lean on in the form of his seniors was big, regardless of their swimming experience. "Three of our seniors are brand new too because they're exchange students," Laitinen said. "Thijs (Pepperkamp), Hagen (Barus), and Nina (Tshopp). They're all exchange students, and this is their first year of swimming. But even just having them because they're older helps a lot maturity-wise." Against West Linn the scores were lopsided against Canby (110-60 for the girls, 123-47 for the boys), but there were still strong performances for the squad. Mairen Chard who finished 1st in the 200 free (2:04.72) and 1st in the 500 free (5:38.93) in a pair of closely contested races. Conner DeRisio finished 3rd in the 500 free. Hunter DeRisio was 3rd in the 100 IM and 100 free. Halana Crispin swam to 3rd place in the 100 fly. Thomas Diggles finished 3rd in the 100 breaststroke. Kira Goepferd was 2nd in the 200 IM (2:30.89) and 3rd in the 500 free. Kylie Hester was 2nd in the 50 free (26.38) and 3rd in the 100 back. Bjorn Laitinen was 3rd in the 100 fly. Elora Paulson finished 3rd in the 100 breaststroke. Alora Robbins swam to 2nd in the 100 breaststroke (1:10.90). Jordan Spencer finished in 3rd in the 100 backstroke. The team is gearing up for the JV and varsity districts scheduled to happen Thursday, Feb. 7 and Friday and Saturday, Feb. 8 and 9, respectively. The JV will swim at Lake Oswego High School, and the varsity swimmers will compete at Mt. Hood Community College. The experience will be an interesting one as the teams were originally scheduled to swim in the outside pool at Mt. Hood Community College, but was moved inside to a smaller pool. "It's going to be a very strange district meet," Laitinen said. "We were supposed to swim in Mt. Hood outdoor pool, and now we're swimming in the indoor pool. So instead of having eight qualify for the final and consolation final, there's only six in each. It narrows down how many people get to swim in finals. "It changes the whole composition of the meet so it will be more top heavy," Laitinen continued. "The fastest swimmers will get to swim and maybe some of our kids who get to swim in finals will not because there's four less spots in every event. We should still do pretty well." Doing well is the goal, but it's spurred on by a philosophy of improvement that Laitinen pushes for his team. "My philosophy for the team is to just try and improve everybody throughout the season," Laitinen said. "We try to aim at the district meet for everyone to do their best events and best work."